The jaw is often overlooked when people think of voice improvement, but it’s a very important component. You want to keep your jaw happy because it plays an essential part in articulation. Good articulation is vital for successful broadcasters and voiceover artists. Let me first give a caveat to what I’m writing: I’m writing mainly about American English. The involvement of the jaw varies somewhat in every language, even with British English. This is especially true with articulation. There tends to be less openness of the jaw, for example, in British English speech. Unfortunately, the jaw is one of the first speech mechanisms that is negatively affected by stress in the body. We tend to clench our teeth when we’re tense or angry. Patsy Rodenburg, a prominent acting coach, says, “…the clenched jaw becomes for the voice what folded arms are for the body: a ‘keep out’ barrier.” This clenching can result in altered articulation of open-jaw vowels. Clenching or grinding your teeth can also lead to a condition referred to as TMD (Temporomandibular Disorder). We have two TM joints, one in front of each ear. They are connected to muscles that open and close the jaw. If you feel pain or tenderness in the area in front of your ears, hear a clicking noise when you open your mouth widely, or you have difficulty opening your mouth widely, you could be one of the 12% of Americans who suffer from TMD annually. This can have a very negative effect on your voice. If you feel you have TMD, you should have it examined by a doctor who understands musculoskeletal disorders, according to the NIH. So how do we keep our jaw healthy? Simple, daily exercises can help. 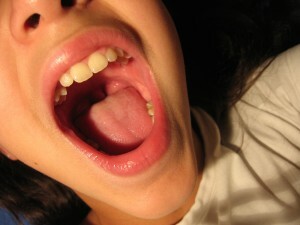 One is to try to improve the openness of your mouth daily by watching yourself in a mirror as you open your mouth. Aim for an opening that allows you to insert your middle and index fingers on top of each other with the edges touchng. Gently try for a slightly wider opening each day. Never exceed what is comfortable to you. Another good daily exercise is to do gentle, circular motions with your lower jaw. This will loosen the TM muscles before you begin voicing. When you finish, let the jaw go into the neutral position you should strive for, which leaves the tongue touching the roof of the mouth, the teeth parted, and the lips closed. Now you’ve got a happy jaw! Watch for my post next month, where you can read more about problems a tight jaw can cause. We’ll look speicifically at resonance and projection issues.